The authorities in Brazil have arrested 60 policemen accused of receiving regular payments from drug dealers to turn a blind eye to their activities in several shanty towns of Rio de Janeiro. 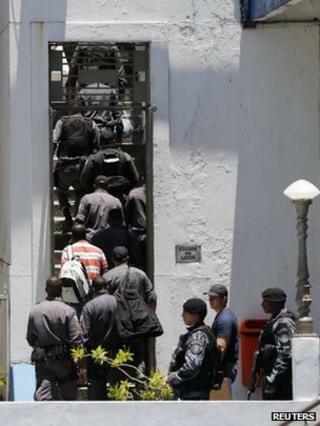 Eleven suspected drug dealers from Rio's main criminal gang - the Red Command - were also arrested. The policemen also sold weapons to the gangs, investigators said. Rio authorities have been trying to reduce crime in the city ahead of the 2014 World Cup and the 2016 Olympics. Rio Military Police commander, Erir Ribeiro Costa Filho, said all officers involved would be expelled from the force. "We can no longer put up with corrupt policemen in our force," he said. The operation, dubbed Purification, began in the early hours of the day in Duque de Caxias, in the outskirts of Rio de Janeiro. Seventy people have been arrested, 12 others - including police officers and alleged drug dealers - are on the run. Investigations began a year ago. According to Globo TV, each police officer is accused of receiving 1,500 to 2,500 reais in bribes per week ($700 to $1,200; £450 to £750). Prosecutors say the policemen were paid to overlook criminal activities in 13 slums of Duque de Caxias, a populous working class city that is part of Greater Rio de Janeiro. They also allege that police offers got involved in a number of other criminal activities - kidnapping drug dealers and their relatives for ransom, and conducting security operations against them if they failed to pay the bribes. The police commander in Duque de Caxias, Claudio de Lucas Lima, has been sacked, but there is no indication that he was involved in the wrongdoing. Rio de Janeiro has been trying to clean up its most dangerous regions ahead of the 2016 Olympics, which it will host, and the 2014 football World Cup. More than 20 of Rio's most dangerous shantytowns, or favelas, have been occupied by police and army forces. But analysts say a crucial part of the programme is to get poor communities in Rio to regain trust in their police forces, which were widely seen as violent and corrupt.